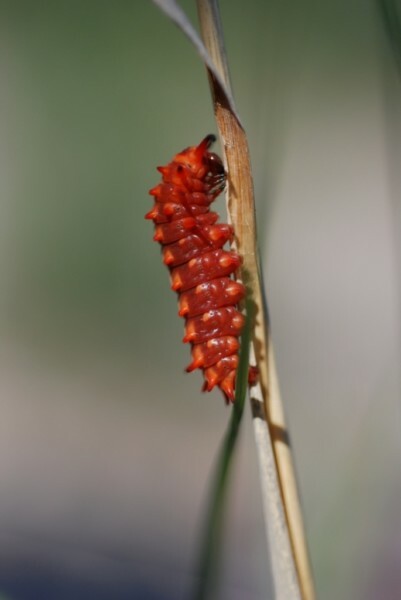 Caterpillars are the larval stage of lepidopterans (butterflies, moths, and skippers), but the term is also applied to larvae the wasp-like sawflies (Order Hymenoptera, Suborder Symphyta). One of the main differences between lepidopteran and symphytan caterpillars is the difference in number of the paired abdominal prolegs: lepidopterans possess five of less pair, symphytans have six or more. 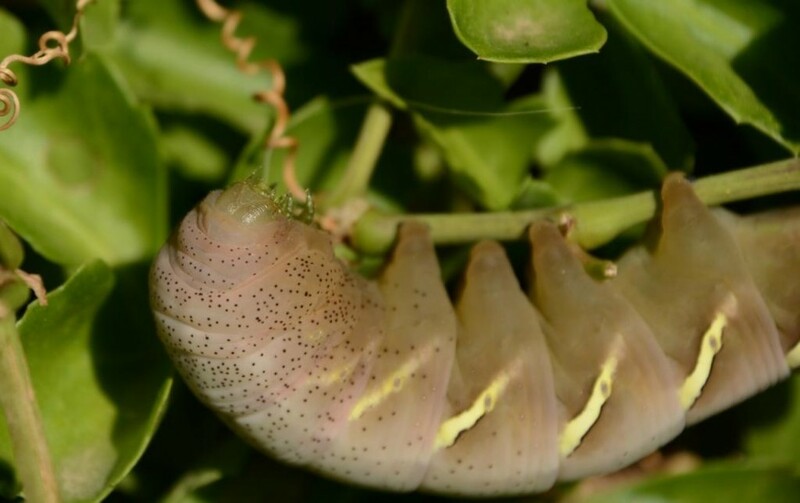 Caterpillars are voracious “eating machines.” Caterpillars have soft bodies, and most go through four or five instar stages, growing rapidly between molts, eventually pupating into the adult form. The amount of growth can be phenomenal. For example, a large hawk moth caterpillar will increase its weight by a factor of about 10,000X in fewer than twenty days. What allows them to consume so much food is a mechanism at work in a specialized midgut that quickly transports ions to the midgut cavity, keeping potassium levels higher in the midgut cavity than in the blood (1). Most caterpillars are herbivores…many are restricted to a single plant species while others may consume a number of types of plants. There are caterpillar species that are predators of the eggs of other insects, aphids, scale insects, or ant larvae. 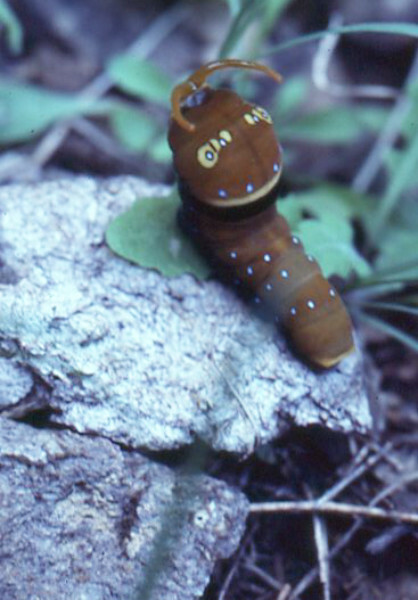 A few caterpillar species are detritivores. Since caterpillars are food for many types of animals, a number of defensive mechanisms have evolved. 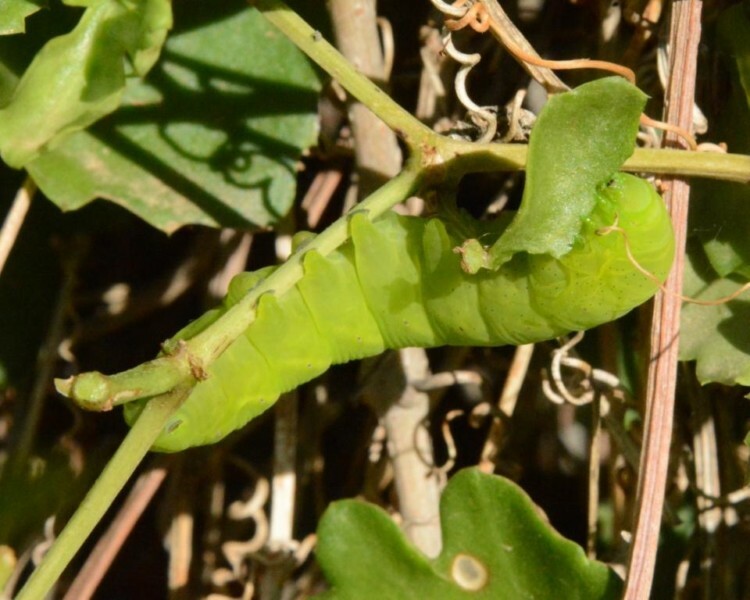 Passively, caterpillars may be cryptically colored and resemble the plants on which they feed; some may have body parts that mimic plant parts. Other caterpillars may appear as bird droppings or other objects in the environment. 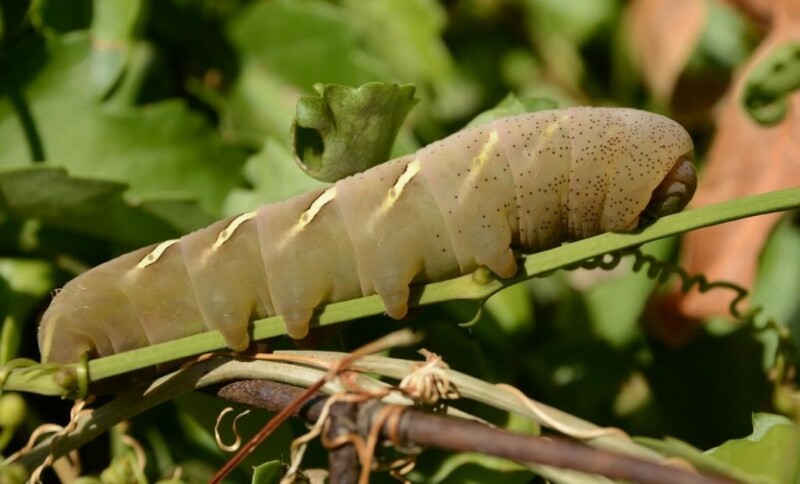 Plants often contain toxins as a deterrent to herbivory, but some caterpillars have evolved countermeasures enabling them to eat toxic plants and sequester the toxins in their bodies, making the caterpillars themselves toxic to predators. Frequently, such caterpillars advertise themselves with aposematic coloration. Some caterpillars are more active in their self-defense. Some species regurgitate digestive juices when molested; some may produce bad smells from extruding glands called osmeteria. Some species violently thrash about when threatened. Lycaenid butterfly (blues and hairstreaks) caterpillars gain protection by their association within ant colonies. 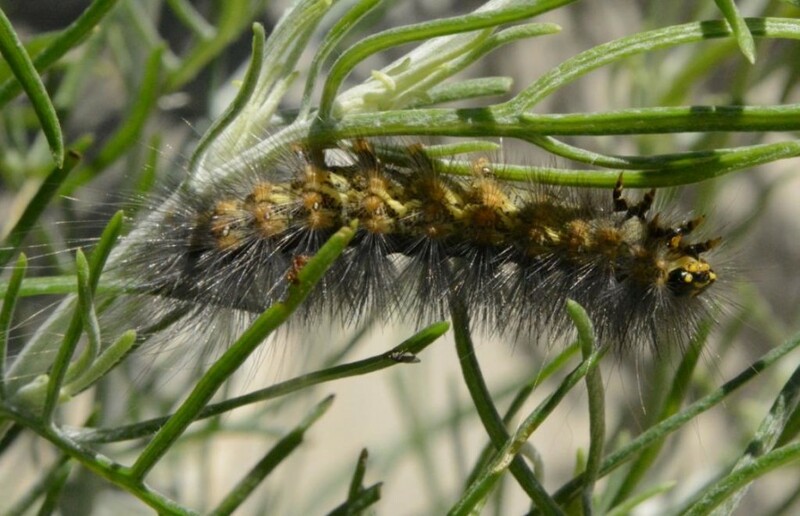 More aggressive self-defense may be mounted by caterpillars possessing spiny bristles or long, fine hair-like setae which can irritate when becoming lodged in the skin or mucous membranes of a predator (2,3). But the most aggressive caterpillar self-defense is associated with venom glands whose effect can be severely debilitating, and in extreme cases, fatal for a predator---even a human (4). Chamberlin, M.E., M.E. King (1998). “Changes in midgut active ion transport and metabolism during the fifth instar of the tobacco hornworm (Manduca sexta).” J. Exp. Zool. 280 (2): 135-141. Diaz, HJ (2005). “The evolving global epidemiology, syndromic classification, management, and prevention of caterpillar envenoming.” Am. J. Trop. Med. Hyg. 72 (3): 347-357. PMID 15772333 (https://www.ncbi.nlm.nih.gov/pubmed/15772333). Redd, JT; Voorhees, RE; Torok, TJ (2007). “Outbreak of lepidopterism at a Boy Scout camp.” Journal of the American Academy of Dermatology. 56 (6): 952-955. PMID 17368636 (https://www.ncbi.nlm.nih.gov/pubmed/17368636). Doi:10.1016/j.jaad.2006.06.002 (https://doi.org/10.1016%2Fj.jaad.2006.06.002). Kowacs, PA; Cardoso, J; Entres, M; Novak, EM; Werneck, LC (December 2006). “Fatal intracerebral hemorrhage secondary to Lonomia obliqua caterpillar envenoming: case report.” (http://www.scielo.br/scielo.php?script=sci_arttext&pid=S0004-282X2006000600029&lng=en&nrm=iso&tlng=en). Arquivos de neuro-psiquiatria. 64 (4): 1030-2. PMID 17221019 (https://www.ncbi.nlm.nih.gov/pubmed/17221019).doi:10.1590/S0004-282X006000600029 (https://doi.org/10.1590%2FS0004-282X2006000600029).